A prototype is a simple trial model of a proposed solution which represents the ideas, design assumptions and other aspects of its conceptualisation. It provides a basic model to test ideas in such a way that a user can experience it. Prototypes are not meant to provide full functionality but enough in order for users to interact, test concepts and most importantly quickly provide feedback. 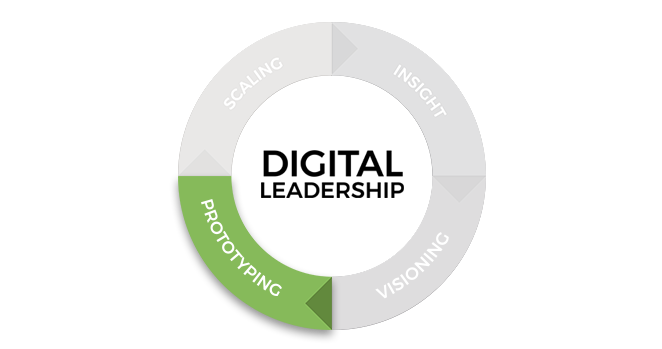 Prototyping is a crucial part of the iterative process to convert visions to reality in today’s digital age and a world of Creative Leadership. Prototyping is an integral part of Visioning because it allows users to engage with concepts and rapidly improve on them. However, why is prototyping so important in developing the Vision? Let us take the case of an exciting new innovative project. Typically, there will be months of brainstorming and discussions to arrive at the blueprint of the product. Then, the next step is building and crafting it to perfection ensuring delivery of a product. The problem with ideas being implemented by people focusing on quick delivery of products to disrupt the market or make societal innovation is that they may implement a working product only to realise that they've been wasting their time or focussing on the wrong thing. This is where prototyping comes in by providing a set of tools and approaches for proper testing and exploring ideas on a shoestring budget. Prototypes can take many forms, and just about the only thing in common is that the various forms are all tangible forms of your ideas. Regardless of extensive and thorough market research and requirements gathering, or whether your ideation sessions have resulted in what many perceive as a disruptive solution, prototyping is still vital for success. Teams involved in creating these disruptive solutions can easily become fixated on the research artefacts gathered during the earlier phases of research, biasing their ideas. Prototyping enables you to avoid these situations by making these processes more interactive through a feedback loop with real users. You can use prototyping as a form of market research at any stage, allowing you to identify opportunity areas for improvement or innovation. Prototyping is a useful method for ideation and a means to explore alternative solutions examining the challenge from different perspectives. As prototypes are the physical representations of a planned solution or product, prototyping gives a logical and methodical approach to seeking feedback. Approaching prototyping through reasoning will help in deriving value from the base research conducted in the ideation process. In today’s age of digital disruption, prototyping is essential in identifying and clarifying problems, developing ideas, and opportunities, especially in enterprises looking at digital transformation and that too fast-paced transformation. Prototyping ensures a continuous feedback loop between the customer and the business providers. Prototyping is a crucial step to better understand the dynamics of the problem, product or system and ensure future resources are invested in the right area. In the search for digitally disruptive technologies, how many times do enterprises invest in new ideas, designs, and costly implementations only to realise after launch that those brilliant ideas had no traction with users. The assumptions which were the base of these ideas may have been wrong and led to a significant waste of time and resources. Prototyping helps prevent this. To enable this, enterprises require a strategic IT partner who can work with you to provide Rapid Prototyping and deliver Scalable solutions. The strategic IT partner is set up to help enterprises embrace the Digital transformation through well-versed methodologies like Frugal Technology Innovation and Innovation Labs and a Distributed Agile methodology. To know more about how rapid prototyping can lead you to bring out working prototypes and scale it up through continuous feedback loops, stay tuned for my next blog on scaling.